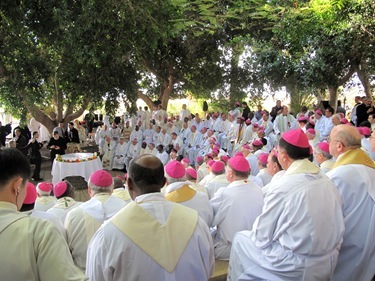 Last week, I was invited to participate in a retreat and conference for bishops organized by the Neocatechumenal Way at their Domus Galilaeae Center in Israel. 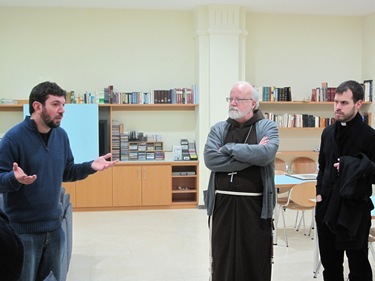 The retreat was organized by the international team responsible for the Neocatechumenal Way: Kiko Arguello, Carmen Hernandez and Father Mario Pezzi. 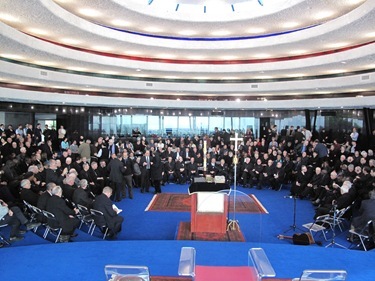 About 200 bishops attended the event this year. Fifty bishops came from the United States, including Bishop McManus of Worcester and Bishop Hennessey, one of our auxiliaries here in Boston. 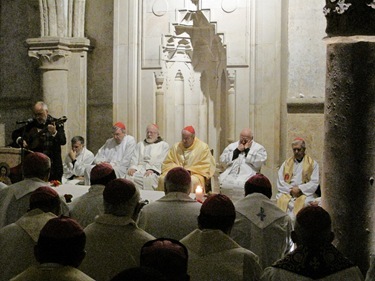 There were also eight cardinals, several Vatican officials and bishops from all over the world in attendance. 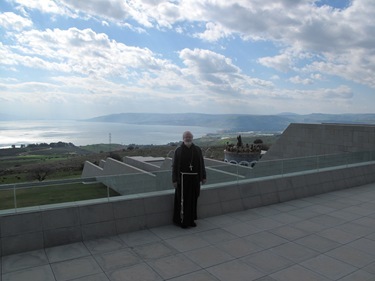 Father Rino Rossi, director of the Domus, welcomed us and told us that over 1,200 bishops have visited this place, as they have attended similar retreats in recent years. 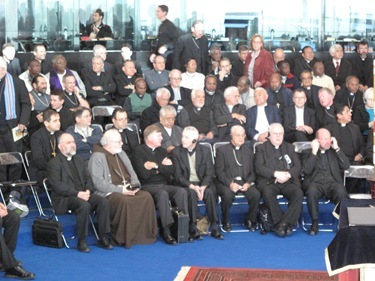 It is an impressive number, about one-third of the bishops in the world. 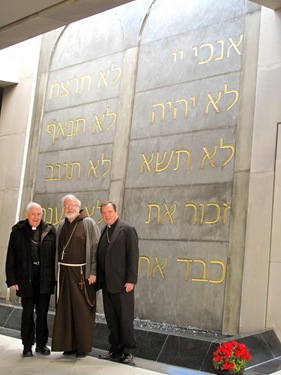 He also told us that the center was dedicated by Pope John Paul II during his visit to the Holy Land in 2000. 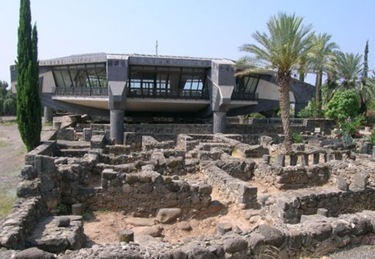 The Domus Galilaeae is on the top of the Mount of Beatitudes where Jesus proclaimed the Sermon on the Mount. 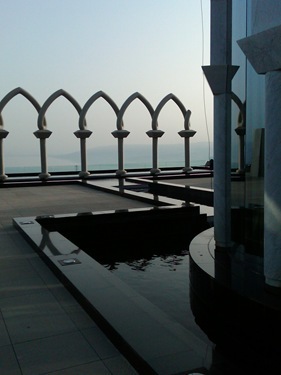 It is an extraordinary place, on the shores of the Sea of Galilee, where Peter and the Apostles were fishermen and around which so much of Jesus’ ministry evolved. The structure of the Domus Galilaeae is stunning. The architecture is very, very beautiful. 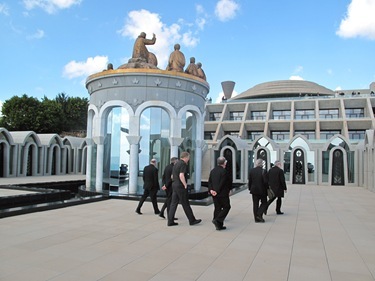 In addition to the conference center, there is also an inter-ritual seminary with seminarians studying for the Latin, Maronite and Melkite rites. 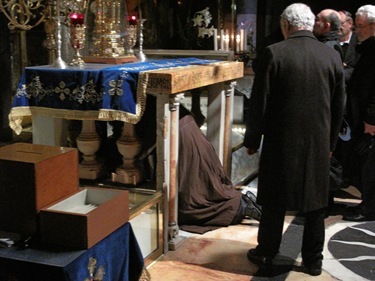 They live in small cells around a chapel in which there is perpetual Eucharistic adoration. 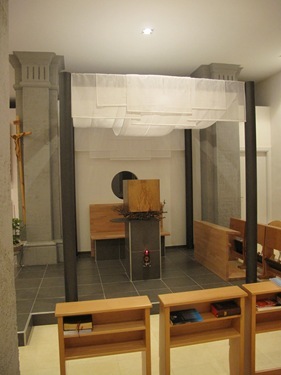 Kiko explained to us that this chapel was the fulfillment of a desire of Blessed Charles de Foucauld, who had wished to build one during his life in that location. 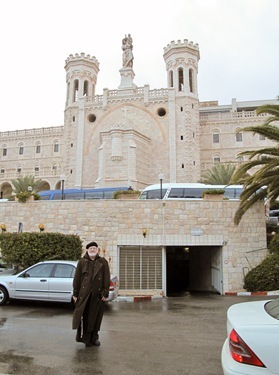 On my only previous trip to the Holy Land, which was right before the jubilee year in 2000, I stayed with the Franciscan Sisters in the convent they have nearby, closer to the Sea of Galilee. I went with a group of priests from Fall River (I was the bishop there at the time) for a retreat. Father Joe Mindling, a Scripture scholar, gave us conferences in the morning and, in the afternoon, we celebrated the Eucharist in different places. 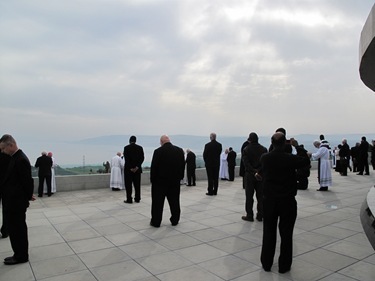 The first day we all participated in a penitential celebration presided by Cardinal Pell from Sydney. 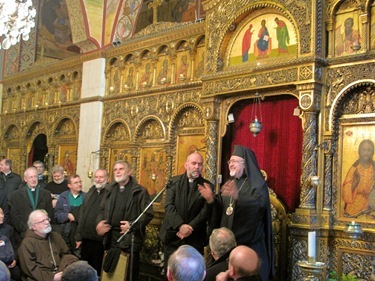 In the afternoon we were greeted by the Melkite Archbishop of Nazareth and Galilee, Archbishop Elias Shakour, who is certainly a very colorful individual. He gave a wonderful introduction and had us all laughing. That evening we were invited to spend time scrutinizing the Scripture, a kind of Lectio Divina. 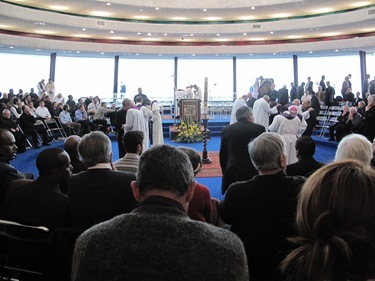 The first day ended with a Mass presided by Cardinal Cordes. 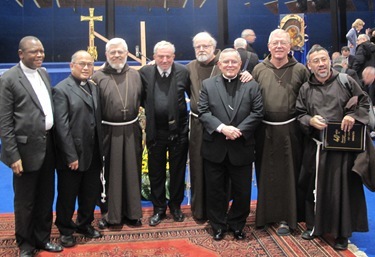 From l.eft: Cardinal Simonis, Cardinal Romeo, Cardinal Cordes (Presiding at the Mass), myself, Cardinal McCarrick, Cardinal Pell and Cardinal Urosa. Cardinal Schonborn arrived the next day. 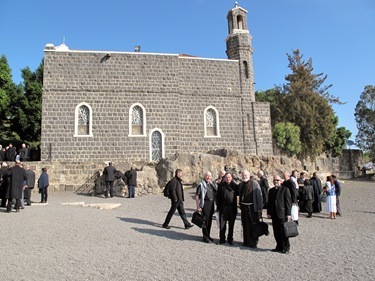 During the retreat there were different conferences on the history and the spirituality of the Neocatechumenal Way, mostly in the evenings, and we visited several holy sites during the morning. After Kiko described his personal itinerary of faith, I told him that I was struck by how many themes in his life have parallels with my own — though certainly not as dramatic as his! 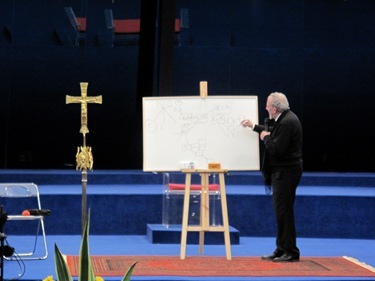 His spiritual “iter” begins with the Cursillo de Cristiandad, which I too attended in my youth. 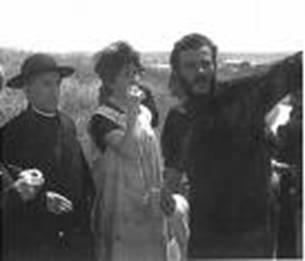 We also share a great devotion to Charles de Foucauld, which was a very important aspect of my own life when I was young. Then there is the fact that he went to live among the poor. 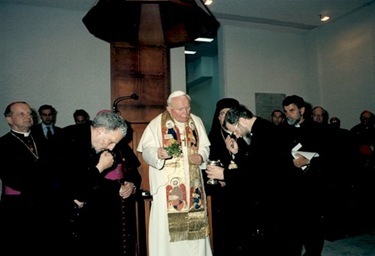 My superiors allowed me to do that after my ordination and it was a great joy. I also ministered to the gypsies in Washington, an extraordinary group of people, who were very important in the experience of Kiko. 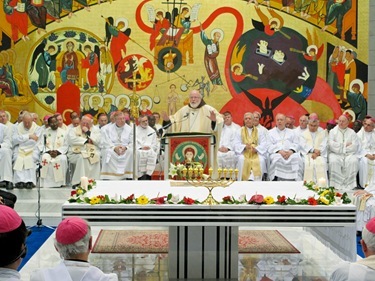 Obviously, the spirituality of the Neocatechumenal Way, so much based upon baptismal mystagogia, is a grace for the Church and is allowing so many people to deepen their own baptismal commitment and to embrace a very radical form of Gospel life. 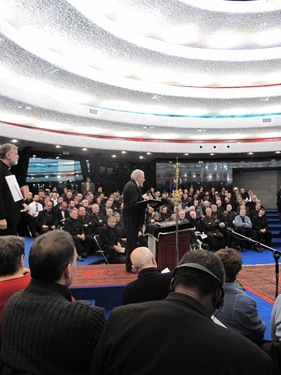 Pope Benedict XVI met last month with 7,000 members of the Neocatechumenal Way and gave them a beautiful speech that underlines this aspect of their charism. 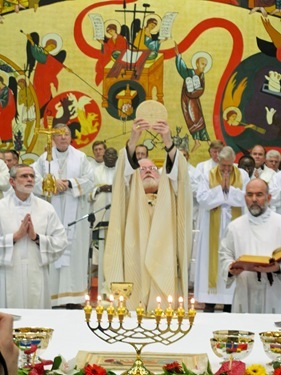 The centrality of the liturgy and the importance of the aesthetical — to allow people to glimpse the beauty of God — are obvious in everything that the Neocatechumenal Way does. 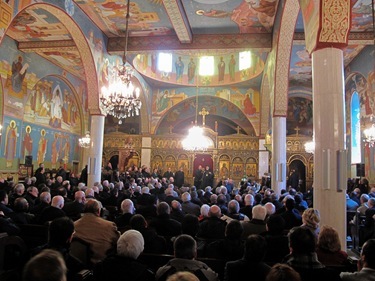 The fact that the founder is a talented artist and musician also is a very important factor in the way that the Way has developed, and how they catechize and evangelize through the beauty of the liturgy, in song and in iconography. 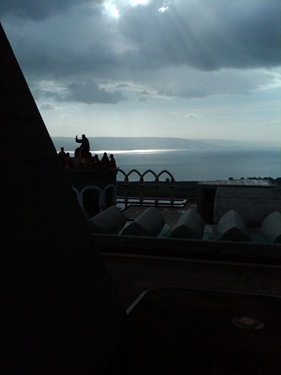 A wonderful aspect of this retreat was the opportunity to visit several holy sites, mostly around the Sea of Galilee. 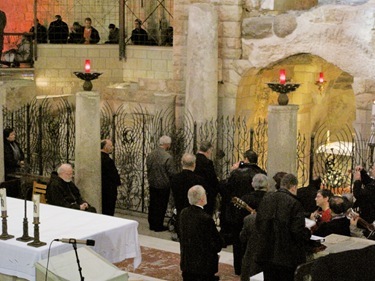 The Holy Land is sometimes referred to as the “Fifth Gospel,” because the geography and the sites speak of Christ and His message of salvation. 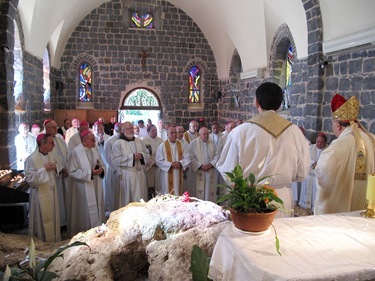 At the Rock of the Primacy of Peter, just a few yards from the Sea of Galilee, we celebrated Mass outdoors. 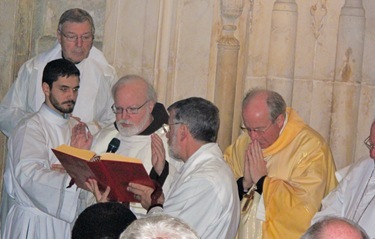 Cardinal Paolo Romeo, the Archbishop of Palermo, whom I have known since he was the nuncio in Haiti, celebrated the Mass. Afterwards we all went into the church in small groups because the church was not large enough for all of us. 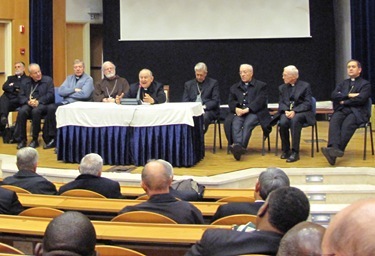 There we entered into a dialogue led by Cardinal Romeo in the various languages in which we repeated Christ’s questions. We were asked, “Do you love me?” the question Christ posed to Peter. 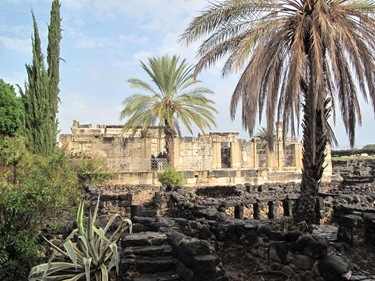 The next day, we went to Capernaum to the ruins of the synagogue where Christ gave his famous discourse on the Bread of Life, the Eucharist, that is described in John 6. 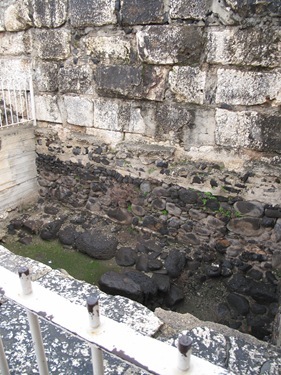 The visible ruins are from a 4th century synagogue, but beneath this archaeologists have unearthed the foundations of the previous one, the one in which Christ spoke. Right across the street from the synagogue are the ruins of what is believed to be St. Peter’s home. 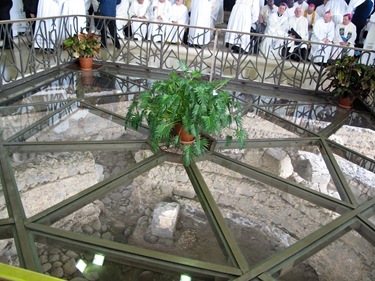 The excavations have shown that very early on it was turned into an octagonal home church with an altar. 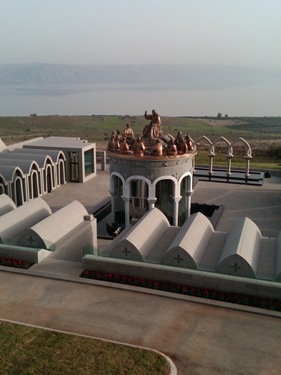 This would have been a place where Jesus would have spent a lot of time in his travels around the lake. 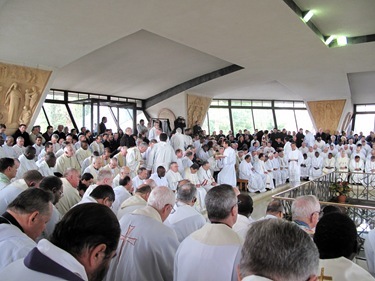 We had the Eucharist there celebrated by Cardinal Jorge Urosa of Caracas, Venezuela. 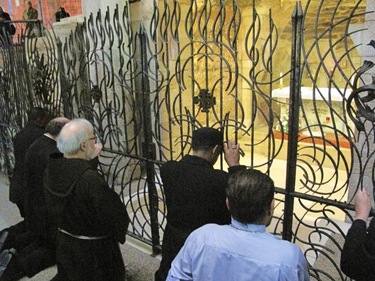 From there, we went to visit Nazareth where we said the Rosary at the place of the Annunciation. 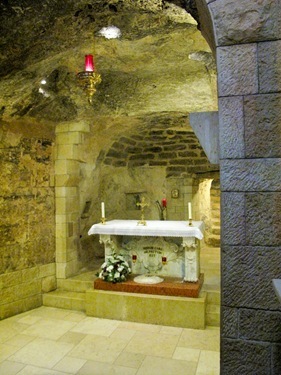 Mary’s house was built attached to a cave. 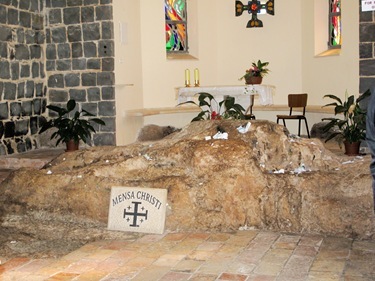 The three external walls were taken to Loreto, Italy by the Crusaders but, of course, the cave remained behind in Nazareth. 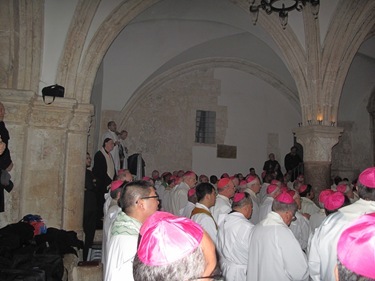 All the bishops were given the opportunity to pray just outside of the cave, which is now enclosed in a modern basilica built by Pope Paul VI. We stayed there in prayer for more than one hour singing the Rosary. It was a very touching experience. 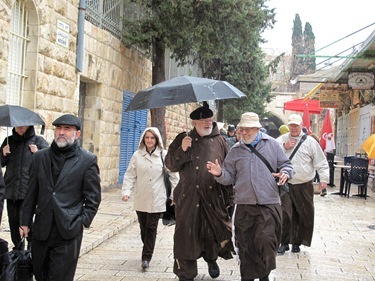 On Sunday we spent the day in Jerusalem, which is at least two hours away from the Domus. 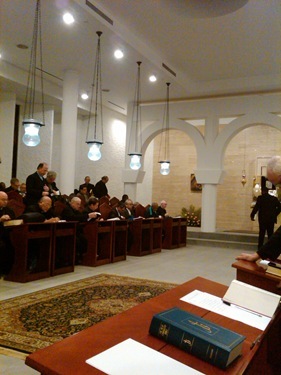 We were greeted by the Syrian Catholic Patriarch Abuna Boutros. 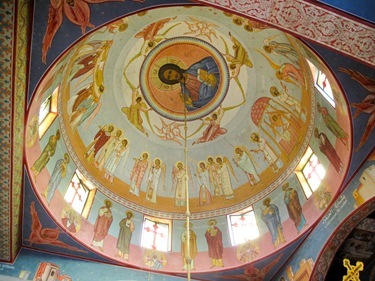 He has a very beautiful Church in the Christian quarter, filled with icons and beautiful paintings. 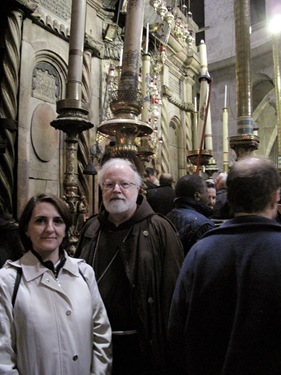 From there we walked in the rain to the Church of the Holy Sepulcher and I had the opportunity to pray inside the empty tomb. 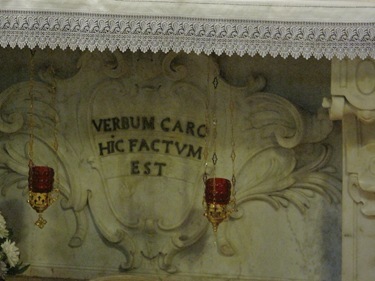 At the entrance of the Basilica, there is the stone on which, according to tradition, the body of Christ was prepared for burial. 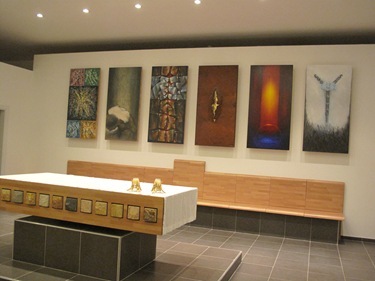 There is also a place, in an upper chapel, which is venerated as the place of the crucifixion. 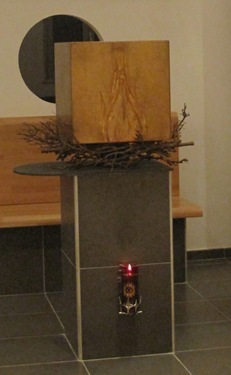 Pilgrims can kneel below an altar and put their hands inside the hole where it is believed the cross stood. From there we went to Notre Dame, a Vatican property in Jerusalem where the Apostolic Nuncio, Archbishop Antonio Franco, welcomed us. 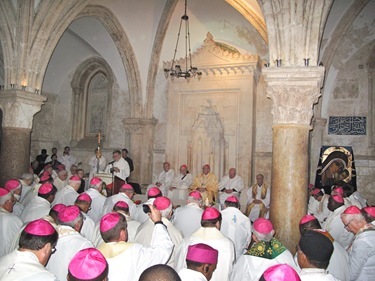 These were all very beautiful experiences but I would have to say the high point of the week was being able to celebrate the Mass at the Cenacle. 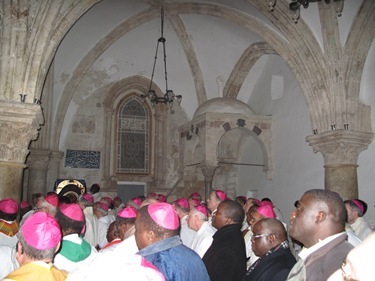 The Cenacle is the “Upper Room”, the place of the Last Supper, the place where Jesus appears to his disciples on Easter and where Mary and the apostles persevered in prayer before the outpouring of the Holy Spirit at Pentecost. It was a great privilege to be there. 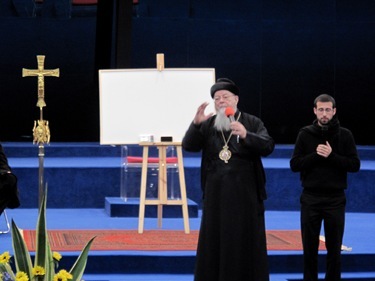 Cardinal Christoph Schönborn from Vienna preached and gave a beautiful reflection. 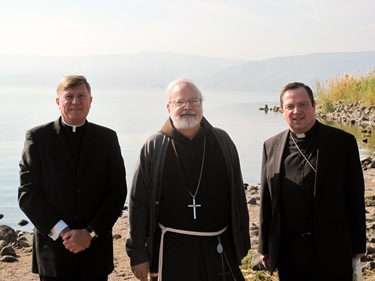 After his homily we renewed our promises of episcopal ordination in that inspiring setting. 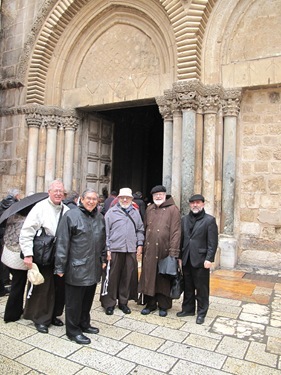 During the last day of the retreat, back at the Domus, we enjoyed a visit by Jewish dignitaries. We were addressed by Rabbi David Rosen, whom I have met here in Boston. 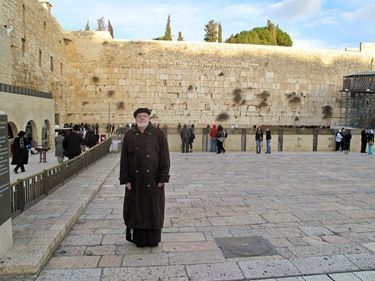 Rabbi Rosen is the International Director of Interreligious Affairs of the American Jewish Committee and has served the Jewish community in leadership posts in Ireland and South Africa. 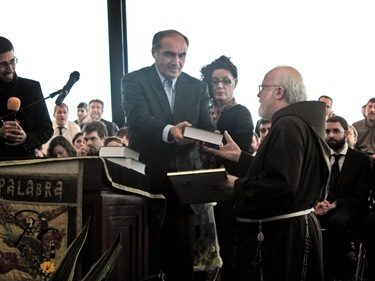 Also in attendance was the Israeli Minister of Tourism, who addressed us and also presented me with a Hebrew Bible. He asked me if I studied Hebrew in the seminary and I answered yes, but a long time ago. He told me I would be tested next year! 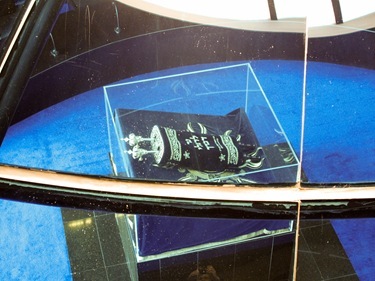 One of the striking features of being at Domus Galilaeae was realizing the extraordinary rapport that exists between the Neocatechumenal Way and the Jewish people. 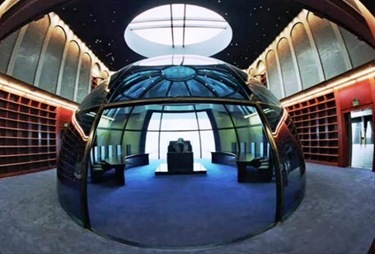 The first thing you see when you enter the Domus is the library, the façade of which are the tablets of the law with flowing water over them. 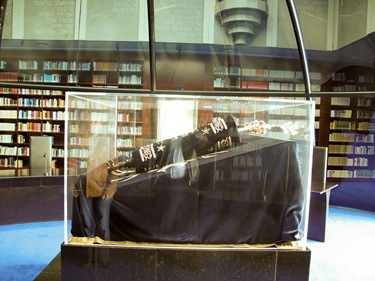 When you enter the library (which houses many, many books about the Sermon on the Mount, being at the Mount of Beatitudes) at the very center is a beautiful, ancient Torah scroll and on the wall is the letter signed by Pope John Paul II in which he makes the particular request that the Domus Galilaeae be a place for interreligious dialogue and initiatives with the Jewish people. 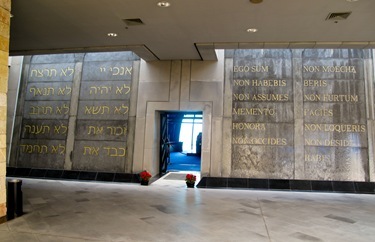 Kiko told us that over 100,000 Jews have come to the Domus Galilaeae. They have also had conferences there with Jews and Muslims. That morning, Kiko surprised us with a new Symphony about Mary he has composed, called “La Espada” (“The Sword”). 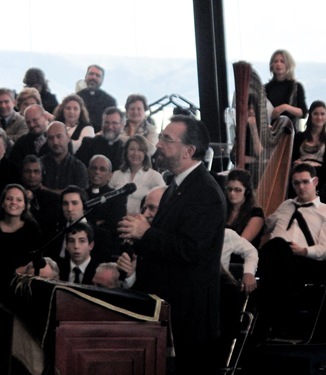 A group of young talented musicians from Spain, all members of the Neocatechumenal Way, performed it for us and our Jewish guests. 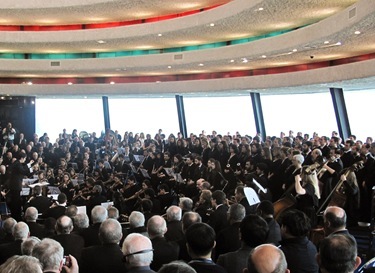 Here is the last part in which all bishops were invited to join in singing. 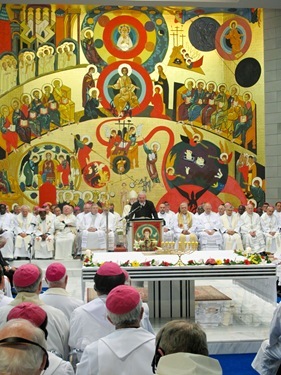 That evening, I presided at the Eucharist at the Domus in a magnificent chapel that Kiko has painted with a beautiful mural of the Last Judgment. The following day, we were supposed to have returned to Boston, but Newark Airport was closed due to the snow storm that hit the Northeast. So, we ended up having one more day in Jerusalem. 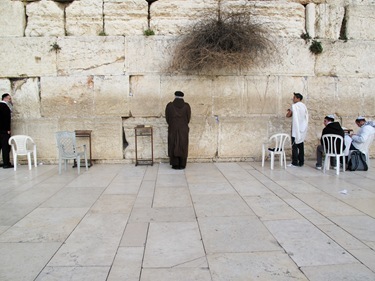 It happened to be the Feast of the Presentation and we were able to go to the Wailing Wall, which is the only standing wall of the Temple of Jerusalem. There we prayed the Nunc Dimittis of Simeon in which this devout Jew recognizes the baby Jesus as the Messiah. 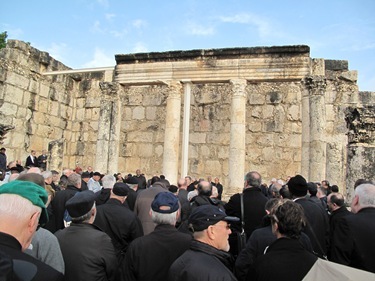 At the wall, we prayed for the intercession of Our Lady on behalf of all of our priests and people of the archdiocese. 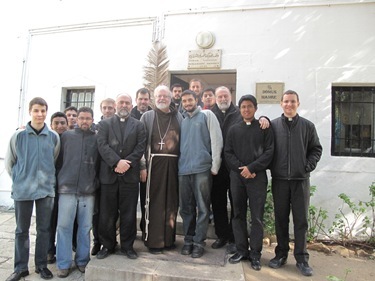 We visited Domus Mamre, a house of studies for seminarians and priests of the Neocatechumenal Way outside the walls of the city. One of our seminarians from the Redemptoris Mater Seminary in Boston, Steven (standing next to me), is there for a time of mission work. 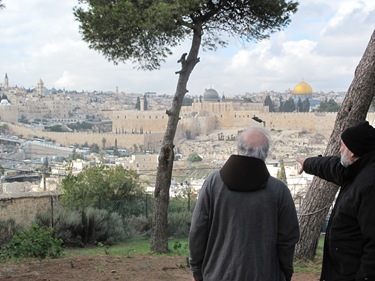 The director of the house, Father Gianpaolo Pronzato, welcomed us and showed us the plans to build a new Domus Jerusalem, similar to the Domus Galilaeae, in that location. 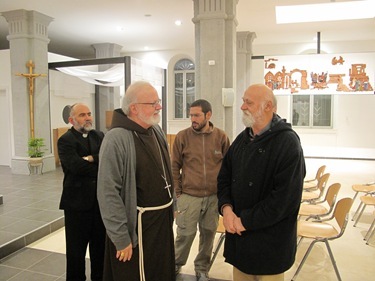 From there, we visited the new spirituality center that the Capuchins of Venice are running in Jerusalem. 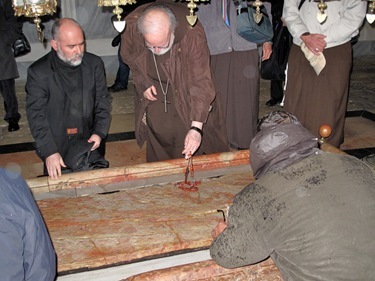 It was begun by Blessed James Haddad, who was a Lebanese Capuchin beatified three years ago in Beirut. 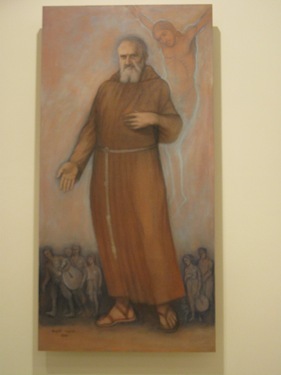 The center has a great deal of interesting modern art. 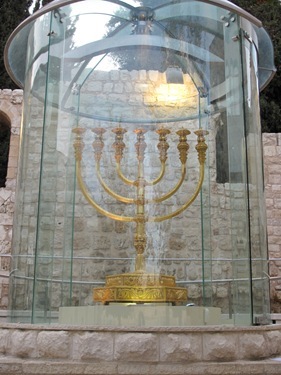 There are features I found particularly beautiful, such as the Sacrament Chapel, where the tabernacle is coming out of the burning bush and where there is a tent above it reminding us of the Tent of Meeting in the Old Testament where God made his presence felt. 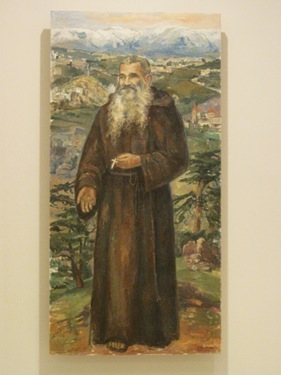 In the back of the Church are paintings of Blessed James Haddad and also Father Benoit, a very famous French Capuchin who worked in Rome and was able to help thousands of Jews escape from Nazi oppression. 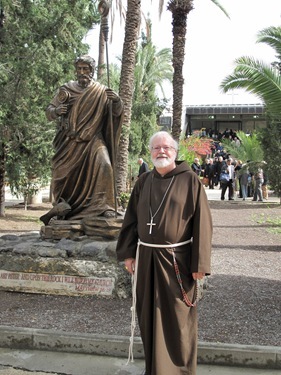 Father Benoit was named a Righteous Gentile and had a street in Jerusalem named after him. 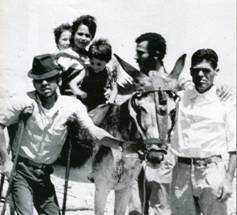 Being in Israel during the time of political unrest in Egypt and Jordan helps one to understand the precarious and unstable nature of that region. Until political solutions that are based on justice can be reached, world peace will always be threatened. I encourage you all to join me in praying for peace in the Holy Land and all of those countries of the Middle East where there has been so much suffering.